Ahh, high waisted jeans, popular in the seventies, are coming back. My original reaction to this trend was that there was no way that I could pull it off, but the thing about trends is that they aren't as difficult to pull off as you think. My main inspiration for jumping into the high waisted jean trend was Olivia (What Olivia Did), who looks fantastic in them and pulls of a retro vibe with them. I love how she styled them here and here. 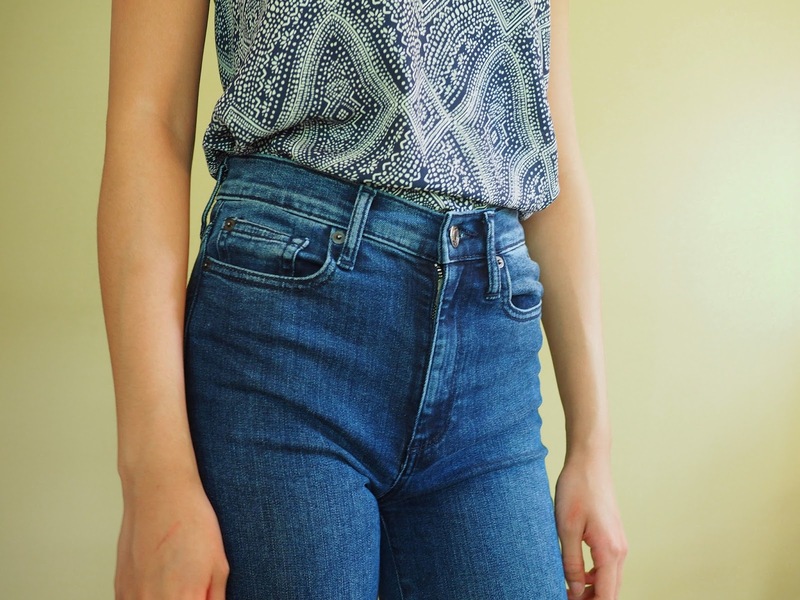 High waisted jeans are so simple, yet have a retro feel and can transform an outfit. And although I couldn't see myself wearing them before, I've been rethinking my decision to hold back now that I've tried them out and loved them. So now that I've jumped on the bandwagon, I thought that I would put the style spotlight on one of my new favorite trends. High waisted jeans originated around the 40s and up until the 90s, it was all that women wore. In fact, lower cut jeans are relatively new to the fashion world. My preference, skinny high-waisted jeans, were popular during the fifties when actresses such as Doris Day began wearing them. High-waisted jeans then took a twist in the 70s and 80s when bell bottoms were created, with more fabric and flaring out. And last but not least in the evolution of high-waisted jeans, the mom jean, which became popular during the 90s. High waisted, tapered jeans that are looser at the top created another variation of the high waisted jean. Today, high-waisted jeans are inspired by all of these vintage trends, but the one that most calls to me are the skinny high-waisted jeans. They have that 50s vibe and I love the style of that time period. 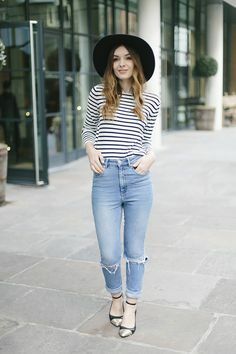 Where to find high waisted jeans? As someone with a very skinny waist, these recommendations are particularly specified to people that are a bit thinner, like me. Since I'm small, I have a lot of difficulty finding jeans that fit me. In order to help all of you out there with similar body types, I figured that I would recommend some stores that have great fits for my body type. Gap // I buy almost all of my jeans from Gap, since they're made out of great, thick material, and they also have smaller sizes, including petite sizes online. I usually buy 24 Regular, but they rarely have my size in store, so I buy online, especially when they have sales. If you need petite sizes, you need to purchase online as well. The pair of high waisted jeans that are pictured are from Gap. Gap has sales all the time too, generally 40-60 percent off, but jeans aren't always included. American Eagle // American Eagle generally has some nice small sizes and are similar to Gap's jeans, but they have more ripped jeans and such that don't necessarily fit Gap's style. If you like distressed and/or ripped jeans, American Eagle has some great selections that Gap just doesn't have. In addition, the cut is similar to Gap jeans, slim and better for smaller sized people. American Eagle often has buy one get one free sales for jeans as well if you're looking to save money. Topshop // I'll be honest and say that I have not actually purchased any high-waisted jeans from Topshop before, but they have a huge selection of high waisted jeans, more than Gap and American Eagle, that sell a mix of low rise jeans and high waisted jeans. Topshop has a bigger variety of high-waisted jeans and I've noticed that they have about the same, if not more selections of high waisted jeans in comparison to their stock of low rise jeans. However, Topshop jeans are the priciest of the three stores that I've recommended. Deciding on the type of high-waisted jeans is entirely up to you! Obviously, there are only so many variations in jeans, but there are still some things that you can pick from. The number one priority on your list while high-waisted jean shopping should be a killer fit. It's no fun to wear jeans that don't fit you well and you won't look good in them unless they're the right jeans for you. Don't try to fit into a smaller pair or a larger pair than you need, it won't do you any good. As for wash, I tend to gravitate towards a darker wash, but this is entirely personal preference. I know that one of my friends prefers lighter washes, it's just something that you should think about based on your own personal style and your wardrobe. What would look the best with the clothes that you already have? If you generally have darker tops, you might want to get a lighter wash in order to get some contrast, but that's just my opinion. How would you usually select jeans? This is no different from the average jean, just with a small variation. Distressed or not is also entirely up to you. I generally prefer to have my jeans not distressed, as it's an issue putting them on in the morning (there are so many holes! how do people do it?!) and they just don't fit my personal style. I do however believe that they can look great on some people and with some outfits, distressed jeans a) make a statement and also in a way b) serve as an accessory. I would use your own style in order to gauge whether distressed jeans are for you or not. It's really not hard at all to figure out how to style high-waisted jeans, but if you're looking for some style inspiration on styling them to their fullest potential (AKA so they don't look like your average jean), I've got you covered! Styled with a crop top // I'm generally not a huge fan of crop tops, but there are definitely some out there that are super cute. I'm not big on showing my stomach, especially since it's not always school-appropriate and it's just not something that I like the look of, even though I'm comfortable in my own body. Styling crop tops with high-waisted jeans instead of low rise jeans allows me to wear crop tops without showing more skin than I would like. In this picture, I've styled my high-waisted jeans with my red striped crop top with lace details at the bottom. The shirt just barely overlaps the jeans so that no skin is showing and the waistband of the jeans are covered. A tucked in top // Literally any top looks great tucked into high-waisted jeans. Tucking in a top allows the high waist-band to be seen. In the past, I used to hate tucking in tops, but I love it now. I do it basically all the time. I don't know what about it that transforms the look and not only makes an outfit more interesting but also more put together. It has a lot cleaner of a look and lets you show off the jeans. Bonus tip: Add a belt as an extra accessory. There are a ton of fancy waist belts out there that you can wear with your high-waisted jeans. It's as simple as tying a ribbon around your waist and tying it into a bow. A simple knit sweater // I've been most inspired by this picture for the styling of a simple knit sweater and high waisted jeans. There's just something about the higher waistband that accessorizes and dresses up an outfit in a whole different way. It can transform a simple solid color sweater and jeans into almost a whole new outfit. I've tucked my green v-neck sweater into the jeans so that the sweater is still baggy at the top, kind of like an oversized sweater, but the jeans tie the look together. How do you wear high-waisted jeans and what are your thoughts on them? Yay! We gladly welcome you to the club! Ahh I love high waisted jeans! Especially paired with the cropped, sleeveless sweaters. I got a pair from Madewell, and they are perfect! You should definitely try their denim if you aren't familiar! I'll note to try them out sometime!